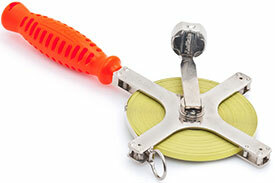 Lufkin Derrick surveying tape measures have a Chrome Clad blade with a nominal blade thickness of .019''. Lufkin Derrick surveying tape measures feature an extra large winding drum provides rapid line recovery and that permits the tape line to be easily detached from reel, a special hook ring with a ribbed face at zero and a leather thong is provided to use through the eye at the rear when the tape is removed from reel. The C2276DN Lufkin Derrick Surveying Tape Measure is one of thousands of quality tooling products available from MRO Tools. Please browse Lufkin Derrick Surveying Tape Measures for tools similar to the C2276DN Lufkin Derrick Surveying Tape Measure. C2276DN Lufkin Derrick Surveying Tape Measure description summary: Lufkin Derrick surveying tape measure. Blade Size Width: 1/4'' Blade Size Length: 100' Blade Style: E1 Quantity discounts may be available for the C2276DN Lufkin Derrick Surveying Tape Measure. Please contact MRO Tools for details.